Earlier this year we learned from Variety that “Gaumont Television is joining forces with German pubcaster ZDF to bring Belle et Sébastien, an animated series based on the popular 1960s TV show created by Cécile Aubry. 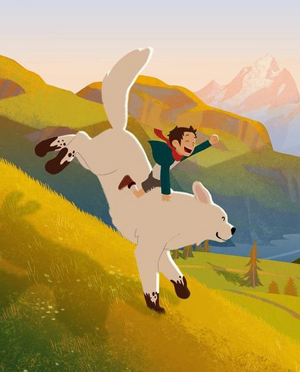 Belle et Sébastien follows the adventures of a 6-year-old motherless boy and his friend, a big white dog, across the wilderness landscapes of the French Alps.” Belle and Sebastien was previously adapted as an anime series in the 1980’s by Toho Animation. Now the latest version from France has visited MIPCOM and they’re looking for international distribution. Animation World Network has a more recent article about Gaumont TV that includes more about this new show.